Welcome all and Merry Christmas! We’re now on Week Two of the Ornament Hop organized by Sherri Falls of This and That. My ornament is a snowflake. I love ’em. But happy we don’t get too many around here (Seattle hills and snow just don’t mix!). CLICK HERE to download the pattern. Aurifil is giving away a box of thread! Leave comments at all the stops for a chance to win a whole box of thread. The stuff rocks — you can’t go wrong! Answer the following in a comment below to enter — does your tree have a color theme? Or is it a little bit of everything? 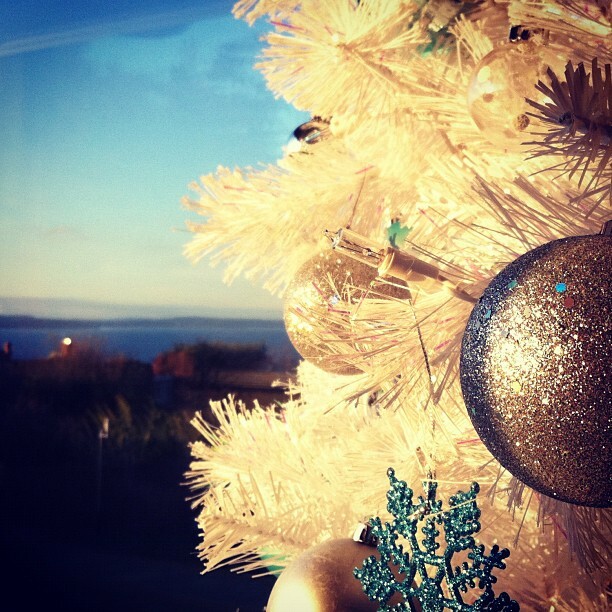 This was ours last year — white tree, silver and turquoise ornaments. I think we’ll do the same this year. Check out the other stops for more chances to win! How cute! Great pattern, thank you! Color theme for tree or treeS…:) I have several, a Victorian, primitive, woodland and one for handmade ornaments. It’s easier than having a 12 foot tree with everything on it! Our tree has a little bit of everything. When our kids were little, their friends always preferred our tree over their perfectly color coordinated ones. thanks so much for the ornament pattern! My tree is a little bit of everything. One year the oldest daughter asked to be able to do it and she made a color combo and it really looked nice. But, many of the ornaments that I had collected through the years did not have the right color so they were not allowed on the tree. So we did not do that again. I love it! A snowflake that I do not need to shovel! Oops! Almost forgot to answer the question! Our tree has a bit of everything. No theme really. We have many ornaments that I have made through the years and of course the ornaments that my kids are making too! No color scheme for our tree. I love mulitcolored lights and lots of colorful shiny ornaments, and the kids do too! My tree has a winter theme; snowflakes, icicles, snowman, mittens, hats, ice skates and a few Santa’s, too! Your snowman ornament will be a perfect addition! Love it! Thanks for the chance to win. I love your ornament! The only theme I have for my tree is ornaments made by me. This blog hop will be perfect to add several more! I don’t put up a tree because I have 6 cats, instead I hang garland and hang ornaments from it. I have mostly red & white ornaments on a green tree. Thanks for sharing your ornament pattern & thanks for the chance to win. Our tree is definitely a little of everything – from homemade ornaments when the kids were in kindergarten ( 20 years ago) to handmade by me. I really like the snowflake ornament – we get less snow than you (central FL) though we did get sleet a few years back. I use white lights but the rest of it has a little bit of everything. Thanks for the cute snowflake. Beautiful! Love the snowflakes, hate the cold! Oops, missed the question — no theme, just an assortment of treasured ornaments. Thanks for the cute pattern – my tree is definitely a little bit of everything but in the traditional Xmas colours. My tree is an eclectic mix of bought and handmade ornaments. We have an ornament from Afghanistan and even have a dreidel! I have a set of plain colored glass balls that ties everything together. 2 years ago we started having a 2nd tree in the kitchen. That one definitely has a theme. Most of the ornaments are cookie cutters tied on with twine and some red ribbons tied in bows on some of the branches. And of course lots of lights! My tree always has a little bit of everything. Love your snowflake. My tree is eclectic. Thanks for a beautiful ornament (we saw a few snowflakes today!). Our tree is a mixture of everything – many ornaments were gifts, so while it isn’t color-coordinated, it has great memories! Wonderful.Last year was all in red and this year we have not thought about how it will be. I have so many ornaments that each year I pick a theme like snowmen, Santas or the oldest ornaments I have. I haven’t decided what this year’s theme will be. Thank you for your ornament design. The only theme I have for my Christmas tree is handmade. There isnt one store bought ornament on my tree. They are ALL handmade (most of them by myself). My tree is just a regular ‘scrappy’ tree, much like my quilts. No theme, just good ol’ old ornaments to reflect memories. 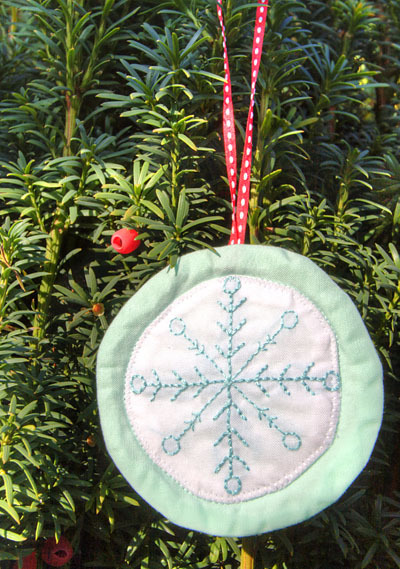 I love the aurifil thread in the snowflake. It is awesome. I would love to try some…thanks for the chance. Thank you for the cute pattern. Our tree is a little bit of everything. Lots of handmade ornaments. My tree is mostly snowman, so the pattern will fit right in. The snow flake looks gorgeous, looking forward to stitching this one. I don’t bother about a colour theme, I have been collecting different ornaments each year for 30 years and I like to put them all on the tree, it grows each year. Such a sweet ornament. I have a granddaughter whose name means “snowflake” so this ornament will be for her. Thanks. We don’t have snow often in our part of Florida, yet my favorite ornaments are crocheted snowflakes that my mother made. She selects our tree theme and I just haul everything in from storage, follow instructions, then haul it back. Thank goodness, as she is more creative than I am on decorations. Here trees always look great. I don’t really have a theme but I try to do put lots of ornaments on it. The tree is 210 cm tall and I have created some of the ornaments myself and last year started to put elves on the tree. The ornaments are left near the tree for anyone to put on. The colours are bright and lively. No snow but lots of snowflake – it doesn’t snow in Australia at Christmas but I do dream of a white Christmas…. My tree is a little bit of everything collected over the years. Thanks for the chance to win. Nice snowflake! Thank you. Our tree ornaments are ‘scrappy’. Many are homemade by me or others. I’ve been downsizing; giving to our kids. I’m thinking I’ll be making a new batch this year. I like these. I have white lights on our tree but the rest of it is decorated with ornaments collected through the years. Some were gifts from students (I was a teacher), some we bought on vacation and some special ones were made by family and friends. I’m not sure how we will do the tree this year. My three grandchildren will be visiting and as 1 year olds, they are into everything! If nothing else, the unbreakable ornaments will hang on the bottom half of the tree! There is no colour theme on my tree. All ornaments have sentimental value and most are “one of a kind”. As retired teachers my husband and I were blessed with new ornaments from our students every year. Add to that some family heirlooms, those our children made throughout the years, and a few gifts from family and friends and you have a good sense of our Christmas tree. I usually put up two trees. One is very traditional…colored lights, and lots of old fashioned ornaments. The other has white lights and white or crystal ornaments. Lots of angels. My tree is mostly handmade ornaments made by myself, friends and purchased at Christmas craft sales. Lights are primary colours and tree skirt is quilted. Your snowflake ornament will be added in the next year. Thanks for sharing your snowflake ornament. My tree is decorated with hand-made ornaments, handed down ornaments and antique glass ornaments. My tree definitely has all colors. Lots of handpainted and sewn ornaments made by me and many friends over the years. I can’t wait to put up the tree again. I love jewel tones, so that is usually the direction i go. I want my tree to look like a sparkly rainbow! Our tree has the theme “Family”. We’ve collected ornaments for each year our son has been with us and other ornaments have been handmade as projects–say, play dough. I love snowflakes and I only see them in California when we travel to Yosemite National Park. Clear lights are my favorite, along with red and whie and clear glass ornaments! I do have a few old favorites that go on the tree, even though they don’ t exactly match! This ornament is one I have to make for my husband. He loves snow. Every year I give him an ornament and I think this year this will be the one. Love your snow flake! It is perfect. I can see a whole bunch of these on the tree. We’ve been married for a long time so the tree is just a bit of everything: ornaments made by the kids, gifts we’ve received, what is left of 2 dozen gold, green, red, blue and silver glass ball ornaments we bought for $1.77 a box for our first ever Christmas tree, my collection of glass icicles and my husband’s grandmothers crocheted and starched snowflakes. No theme here, just memories. I use mainly red, green and gold as I like it to be traditional. however on the trees in the children’s rooms anything goes. Thanks for the snowflake. Nothing is prettier or easier to make for anyone than a snowflake! Ourtree usually varies from year to year. This year I think I will go back to a traditional Christmas and pull out all my homemade Christmas ornaments. Thank you for you beautiful design and plan to make my snowflakes in am array of Auriful thread colors. Our tree is a little bit of everything, with mostly homemade ornaments that I have collected since I was a young girl and since my daughter was born. We love it and all the memories it holds! Every year my tree has a bit of everything, no one or two color theme for me. I have a lot of homemade ornaments, and each year I pick up a few new ones. Thank you for this design and a opportunity to win a prize. Our tree is a mismatch of ornaments gathered throughout the years. Brings back lots of memories that way. Love your ornament. My tree is decorated with a “scrappy” collection of old and new ornaments and lots of them that all hold special memories. Our tree has a little of everything with a quilted tree skirt in a diamond log cabin pattern. Thank you for the snowflake ornament! Trees, one just doesn’t do it! You have to be a Santa to get on the family room tree. In the living room you need to be glass or white and red. In the guest room it’s a southwest theme and on the sunporch you need to be homemade, preferably when the kids were in grade school. Love those teachers who have kids make an ornament!! I love the snowflake – thanks for sharing! We always go to the tree farm near us and pick out a tree. Then we decorate it with all the ornaments we have collected over the years. It has become quite a hodgepodge but it is fun to remember the stories that go with each one. Cute ornament. It reminds me of the cut out snowflakes we used to make. Our tree has a bit of everything. We have collected ornaments from places we visited. I would someday like to have a second tree and only put snowmen on it. Your ornaments is adorable!! My tree is fill with handmade ornaments made over the years by myself or the kids. A big mix of colors!! No kids left at home so we don’t usually put up a big tree. A little 3 foot pre lit tree with homemade ornaments with pictures of the grandkids made for us several years ago is it. I think that is why I love these handmade patterns! such a pretty ornament, thanks for sharing! No, our tree doesn’t have a colour or a theme. We collect ornaments each year, usually when we’re away, so everything has a memory – I suppose that could be a theme! I suppose my theme would be best described as “Stuff I like”. Lots of ornaments given to me by my mom when I got my first apartment. Things I have made all the way back to elementary school and Girl Scout days. Things my fiance’s late mother made. Things my mother made and things she still sends us as gifts. Things we pick up on trips we take. There’s a lot of nostalgia and memories on my tree at Christmas. A bit of everything, and a lot of memories on our tree. Thanks for the adorable pattern! Theme? Tree? Festive? Ahhhhh! More like the tree is an after thought used to thinly disguise the depression that consumes me this time of year. Last year with our grand kids and daughter here while their dad was deployed I did my best to be jolly and having to purchase all the decorations, as it has been years since I last had a tree up, I ended up with a lovely blend of ice blue and lavender. 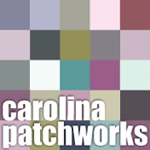 It served as a very soothing color scheme. A bit of whatever is at hand is what ends up on our tree!!! my tree is mostly red & green, but all colors are welcome!! your snowflake is adorable!! Green treat with gold, silve and crystal ornaments. Love your snowflake. Thanks for the pattern. Our tree is very eclectic with a mix of handmade and collector ornaments. My tree is full of collected ornaments, and handmade ones by me, the kids, and the grandkids. No special colors. Thanks so much for your ornament. We always have an old fashioned Christmas theme w/ our tree & decorating so it’s never one specific color theme but I do prefer clear lights on our Christmas tree & for outside decorating. Thanks!! I have a country theme as I have white lights for me and my hubby likes the colored ones. Our oraments are bought and homemade it various with which ones we feel like putting on the tree for that year. Their new dated ornaments for my boys and my ornaments that I have received from ornament exchange. I like your snow flake as I like them better then the ones on the ground. Easier to drive thru. My tree usually has a color theme then a little bit of sentimental ornaments. This ornament blog hop is so much fun. All of the ornaments are so cute. Thanks for the patterns. My Christmas tree doesn’t have a theme. Our ornaments are home made and store bought. One year when the grandkids were small, we all made ornaments and adorned the tree with them. It was the cutest tree ever. My Tree is covered with my 4 kids ecclectic mix of ornaments, so no color scheme. Just very colorful and full of memories. No colour theme, just cute little decorations I like. I usually have two trees one is very eclectic with an assortment of vintage ornaments the other tree is a silver tinsel tree which I decorate with silver blue ornaments. No theme for us! just a bit of everything made/bought over the years! I love. Theme is memories of past and future. In other words ornaments are from way back until today. I even save icycles–the silver thin-like strips!. My grandmother always did, so I do. I don’t save wrapping paper, but she did and then she ironed it!! My tree is all about special ornaments collected over the years. Multi colored lights and tinsel. Thanks for sharing your ornament. Our tree is always a real one…sometimes down here in SETexas, dead as a FRUMP by Christmas. What is a frump? Don’t know, but that’s what my youngest daughter announced to the grocery store clerk many years ago! Love to remind her of that! Ha! We use colored lights and a hodgepodge of ornaments collected over the 46 years of our marriage. I do try to modernize the other decorating to keep a fresh approach, adding many ideas from our friends at Pinterest! Love snowflakes…thanks! May add some sparkle with metallic thread, although it is great as is! Our tree is red and green – not by design, it just ended up that way! Our tree has many colors because of the collection of ornaments from over 40 years. I have added white ribbon and some silver to change it up from the cranberries and popcorn we used when our kids were young. Gorgeous ornaments. Our tree is an eclectic mix of old, new, hand-made, purchased, expensive and less expensive ornaments. Out topper tilts to one side, but it is the most gorgeous tree to me. Thanks for sharing. MY tree depends on my whim at Christmas. Last year I had a silver, glittzy, crystal with white trees, very mono looking but it was beautiful. I have a couple of smaller trees that I do other themes with or just use all of our old ornaments that have become old friends over the years. A little bit of everything! paper/popcorn/cranberry chains, ornaments old and new (some store bought, others handmade), lights and tinsel, and lots of love! Thanks, Emily. It has no rhyme or reason except we love them all! We don’t get many snowflakes here in Southern Cal either! Thank You! Your ornament is so cute. Our tree usually has a bit of everything on it but once in awhile we go the themed route. It is very pretty to have a theme but then I miss the ornaments that I can’t use because they don’t fit. I think I really need to have two trees. Love the snowflake! My tree is a collection of everything through the years. Snowflakes are so great for winter decorating! Thanks for the cute pattern. very pretty little snow flake. Our tree is a bit of everything – lots of memories! My tree is a little bit of everything, from the little knitted stocking ornament from when I was a baby (and I’m 61 now), and a mix of homemade and purchased ornaments from over the years. I have a different tree each year. The prettiest one and I will do again this year is my Peacock tree. I love peacocks and have so many peacock items that it really makes a beautiful tree. I love your snowflake ornament and already know how I plan to display the ornaments in this hop. My tree always has a little bit of everything as I use ornaments I have collected over many years. I love the snowflake. My daughter is getting married in December and we are using a snowflake theme for the decorations. I think I will make her one out of purple and silver (her wedding colors) and the date on the back as a momento. Thanks for the pattern. Our tree is pretty much the same every year; clear lights with silver and gold ornaments, with some red accents for extra color. Love the snowflake; and here in MN we see alot of the real ones! We have the traditional green and red christmas. I am loving this stitchery ornaments – hairlooms in the making. Thanks for the snowflake ornament pattern. Sometimes I pick a theme with a big ribbon or garland. Then with the ornaments in between, I like to just mix it up. Our tree has all colors! Most ornaments are hand made or a momento from a vacation trip. Decorating the tree is like walking down memory lane! Love the snowflake ornament. I plan to make these & use them for package tags for our gift ecxhanges at work. Just as the first trees I remember from my childhood, our trees are a collage of all the different trees that preceeded them. Love the snowflake! I use white and everyone loves it I add a couple new items each year. I never tire of it main tree with the presents!! I have a smaller skinny tree that is hodgepodge all sorts of ornaments from everyone and the kids. It is in my family room. Thank you for sharing your lovely ornament. Our Christmas Tree has a bit of every colour! Snowflake, prettly little snowflake. Don’t get much of those in sunny South Africa, but always lovely to make and look at. Nope, no color theme. Through the years we have collected a little bit of this and that. But our tree is full of sweet memories. Love the snowflake ornament. My tree is mainly red and white with a little bit of everything else thrown in. My tree has white lights, red apples and red strung (plastic) cranberries on it. I love the red and green of it and it’s simple and old fashioned looking!
. Thank you so much. I have been wanting to make ornaments for a long time. Our tree is a little bit of this and that. I have ornaments handed down from my mom and dad when I was little and ornaments that my kids made and ornaments that I made and some that I bought. Our tree is a mix of everything, I love it. We don’t have themes but my husband does like to change the lights each year. That’s been fun. Beautiful ornament – I love it! Ours is a jumble of colors and memories, just the way I like it. Ours is a cheap plastic tree loaded down with lights and ornaments of all kinds. Handmade, kid made, from trips. Love it! Every year the day after Christmas, we went to an exclusive furniture design store and bought a box of ornaments. They were made all over the world. We did this until we could not fit another on the tree. My Mom also bought my daughter the ornament of the year from Hallmark and Lenox. So we for sure have a memory tree. Now my grown daughter and family have the ornaments and I go help decorate and tell the grandchildren the stories behind them. It’s wonderful memories. I love the snowflake. We have a real tree and we have blue and silver decorations plus some ornaments the kids make. I like white lights on our green tree, with a mix of handmade ornaments and store bought balls. this year I’m planning to do turquoise and red, but I never end up doing exactly as I planned! Lovely!! Thank you so much for the pattern. Our tree is a total mish-mash of ornaments made, purchased, and gifted to us over the years. Each year when we pull out the ornament collection it is such a joy to recall where they all came from and to add more. 🙂 Good times. Lots of great memories. Does no Christmas tree count? We always had a real tree and homemade ornaments when the kids were still at home. Now that they’re grown, with families of their own, we go to see them… and don’t put up a tree at all. Hoping I still qualify to win. Those Aurifil threads would be wonderful to own. Thanks for the chance! Your ornament is stunning! I love snowflakes! Our tree theme is gold and mauve! Now that my girls are in school however, it’s kind of getting to be a bit of everything with their handmade ornaments! :)! I love, love, love Snowflakes and plan to make a dozen of these in different colors for the tree in my Studio. Of course I will use Aurifil Threads to get the best colors! Thank you for the free pattern and the HOP! such fun! I love, love, love Snowflakes and plan to make a dozen in different colors. They will look great on the tree in my sewing studio. Of course I will use Aurifil Thread to get the best colors. Thank you for the free pattern! 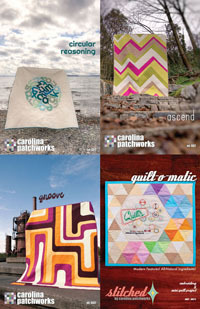 Pingback: Carolina Patchworks · Aurifil Christmas Ornaments: all together! I love this little snowflake ornament! This fellow west coaster appreciates being givent the pattern and sincerely hopes that this is the only type of snowflake I see this winter – except for the ones up on the mountians that is! My tree is a mix of ornaments, on a (preferably) real tree. It has some from when I was a kid, to the ones representing my son’s years, and lots of glittery snowflakes and icicles. It’s fun to see how others decorate theirs, though. I don’t have a colour scheme for my tree, just lots of bright colours and lights! We try to stick to a color scheme but it never works! It ends up being all different colors with TONS of ornaments! My husband would love the c-9 lamps but first of all I can’t find them on a strand and second of all they get very very hot. He wanted tinsel last year so i did put some of that on but not my favorite. I love adding special ornaments and hope to add these from the hop. thanks for sharing. Já tive bastante colorida…De uns tempos para cá faço cada ano de uma cor,este é verde com vermelhos,bem original acho.Obrigada. Love this snowflake!! Thank you! Thanks for the snowflake pattern,its so cool! Our first Christmas tree was a Jade plant we decorated with starwars toys and ribbon….we were short on money and new to the whole holiday thing.Twenty-five years later we’re a little more savvy and now we make ornaments yearly,with our grandkids, and decorate a fake tree. Its looks almost like a quilt when we put all our ornaments on. The snowflake will be a nice addition. My tree is a collection of mostly handmade ornies. Love the snowflake pattern. Who doesn’t love snowflakes?? Thank you for this adorable pattern….love it. I love love the patterns,can”t wait to get started.I’m just beginning to do embrodiery,so I really need thread.We have a tree with lots of old ornaments from the past 50 years and love the memories.love this snowflake pattern. I love the idea of themed trees, but I never do because then I wouldn’t be able to display all our old ornaments LOL! Hmmm … maybe I should keep the traditional “little-bit-of-everything” tree for our main tree, and then do a little themed tabletop tree … best of both worlds LOL! We don’t put up a tree. Mine is traditional red and green. My tree is eclectic and I love it that way! Love the snowflake ornament! These would also make such cute coasters. My main tree is a collection of old & new ornaments & I have 3 little trees that I decorate in red & white. I love your snowflake ornament. My tree is done in red, green and silver. With lots of handmade ornaments & family ones. Love the snow lake! My tree is a little bit of everything. Now I can add your snowflake. We have everything on our tree! mixed up and fun! thanks! Our tree is artificial green and most of the ornaments are white and red, because the other colors, even if shiny, don’t show up as well on it because we just have strings of teeny mini lights and no spotlight on it. This ornie is going to be the first one that I stitch! My tree is full of everything. Kid made, hand made and things that caught my eye. Our tree is trimmed with all kinds of ornaments collected over 36 yrs together. Each year I try to add another, with your snowflake I think this will be the perfect addition. Thank you and Aurifil for all the wonderful designs and threads. I have many, many themed trees. Check out my Kwilty Pleasures blof fun that starts today with 12 days of decking my halls. Come see my themes! Thanks for the cute ornament pattern! Multi colored, memory tree ornaments collected over the years. Cute ornament. Mi piacciono gli ornamenti natalizi, e cerco di ricamarli anch’io, grazie per il tutorial!